From Maidstone Telegraph 10 December 1864. On Sunday morning last the body of Peter Pope, an aged man was found in the water called the Isles, at Fowl-hill, Yalding, in the occupation of Mr. C. Gibbs. He had been missing for nearly a week. 1861 census shows Peter Pope at "New Inn," Yalding, Landlord, John Pope, probably a relative. Kent & Sussex Courier 25 April 1924. At an inquest held by Mr. A. H. Neve at the "New Inn," Yalding, last week, a sad sequel to the housing difficulty was investigated relative to the death of the four-year-old son of Mr. and Mrs. Medhurst. The father, Thomas Medhurst, a farm Labourer, stated that when he and his family had to leave Tonbridge a month ago, the only accommodation they could get was a converted hooper hut at Yalding, with his brother-in-law, who had four children. With witness’s family there where eleven people living in the hut Dr. Sealey stated that he attended a year-old baby which died from gastric trouble a few days before the death of the other four-year-old child. He was not called in until after the child’s death, which he discovered at the post-mortem was from lung trouble. Horace Simmons, the owner of the farm of which the hopper house is situated, stated that the Medhurst family came there without his knowledge or permission. The sanitary arrangements were good. The Coroner, in summing up, said he felt an enquiry necessary owing to the unsatisfactory condition of overcrowding, which in cases of illness became dangerous. He accepted Mr. Simmons’ statement that what happened was without his sanction, and he hoped that the Rural Sanitary Authorities would see that the overcrowding did not continue. He returned a verdict of death from Natural Causes. From http://www.twtowncrier.co.uk accessed 13 August 2018. The Lost Pubs around Paddock Wood: Part One. 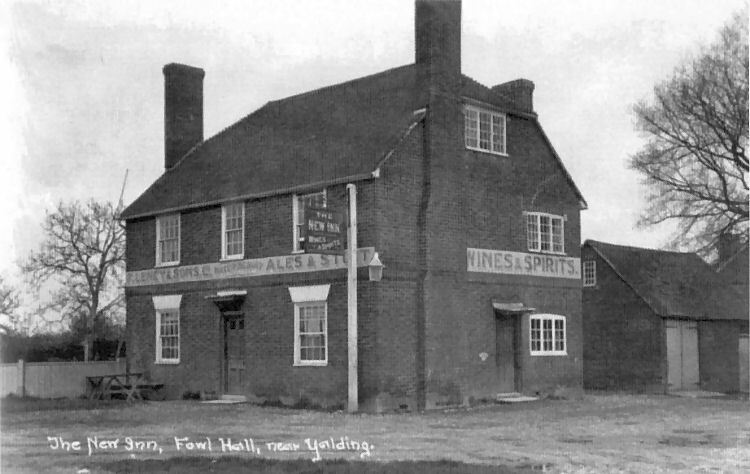 Starting with the area known as Queen Street, the "New Inn" was situated on the boundary with Yalding parish. The 19th century census entries state that the inn was actually in Yalding in the area known as Fowl(e) Hall. In fact, the beer stored in the cellar was drawn in Yalding and drunk in Paddock Wood (then a part of Brenchley parish). When it first began trading is not known but the house itself was built in 1797. In 1841 the licensee was John Pope who held the licence until the mid-1860s after which landlords came and went on a regular basis, one of whom, Arrow Smeed, licensee in 1890, would surely have been a contender for the title of Britain’s oddest named publican. The pub changed its name to the "Kent Arms" in 1947 following the re-naming of the "Kent Arms" in Paddock Wood to the "John Brunt VC." In the 1950s trade consisted almost entirely of local land workers and, during the season, hop pickers. Because it was located some way from the prying eyes of the law, after-hours drinking appears to have been a regular occurrence, the pub remaining open until the last customer had departed. Dwindling trade caused the pub to close in January 1996. It is now a private house called The Old Inn.